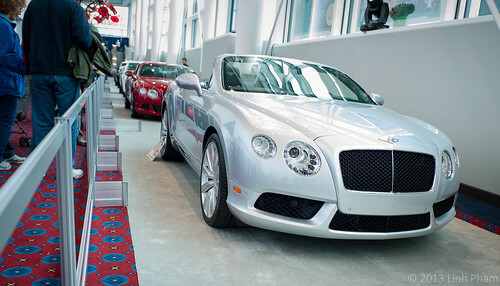 After my usual Saturday morning ritual of going to PDX C&C, I decided to go to the Portland Auto Show held at the Oregon Convention Center with a fellow friend, Samuel, from the group. 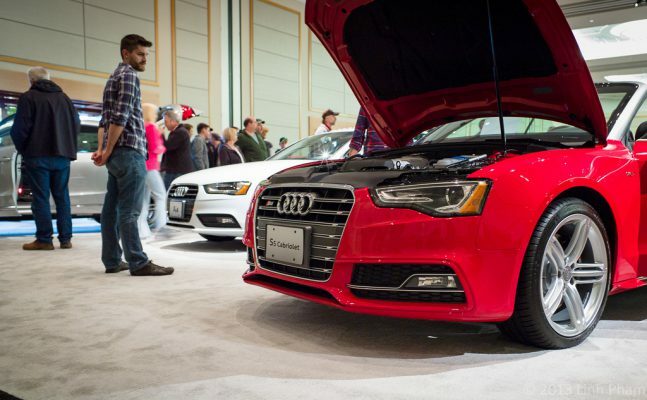 It is kind of sad to say, that as a car guy, I have not been to the Portland Auto Show (much less any of the more vaunted ones like Chicago, Detroit, Los Angeles or New York). The reason why I haven’t really wanted to go in the past was the perception and rumors that it would be a constant sales pitch by people on the floor. So, I finally decided to go and see what the hubbub was all about. When I got to the Convention Center, both of its parking garage entrances were blocked off, stating that they were full. So, I went to park in one of the neighboring overflow parking lots for the Rose Center a few blocks down. Cost of parking was $10 and the ticket to get into the auto show was another $12. Equipped only with my phone, my Leica M9 and a Voigtländer Ultron 28mm f/2, I met up with my friend at the Jaguar stand, which had a four or five cars on display, including a XF and a XJ L.
We then went into the main hall where the volume brands have their stands and cars, including stopping to look at the Subaru BRZ, XV Crosstrek and Impreza, walked past the Kia display and meandered about. 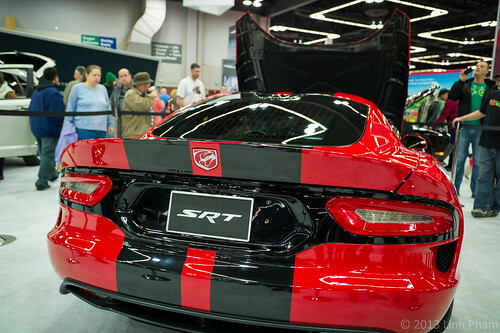 As we crossed one of the aisles, I caught a glimpse of the new SRT Viper dressed in red and black. It looks as gorgeous in person as it does in the photos. As with many of the other really valuable or near-production ready models, it was cordoned off. I continued over to the Fiat display and got to sit into the Fiat 500 Abarth. I was surprised how well I fit into the relatively diminutive car and still was able to scoot the seat back a bit further. The only thing that didn’t quite impress me with the Fiat 500 Abarth was the rather sloppy and rubbery feel of rowing through the five gears. It wouldn’t be the only car with a manual gearbox on display, but it’s definitely a minority amongst the see of slushboxes and rubberbandy CVTs. After a quick stop to check out the new Toyota Avalon, the next stop was the Mini display. There was a Mini Cooper on display with a manual gearbox; and, in contrast to the Abarth, its shifter had such a crisper feel and rowing action. I had to control myself from laughing out loud when I saw the Mini Coupe on display, with it’s funky looking roof. While checking out the Mini Cooper JCW, my friend was checking out the not-so-mini Mini Countryman. 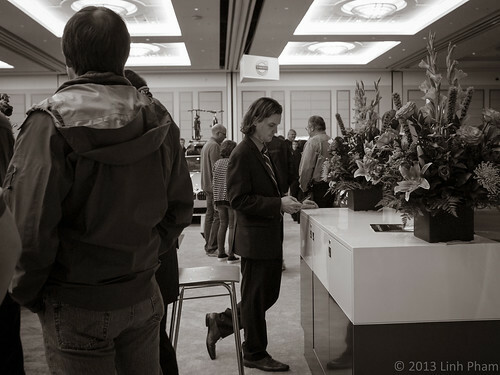 We both meandered from the Mini area over to the Lexus and Acura stands, looking at the new Lexus LS and the Acura RLX. The overall exterior styling of the RLX is pretty bland, with the exception of the LED headlights. The Cadillac display included a couple of new ATS and XTS sedans, along with a CTS-V coupe. Too bad there wasn’t a CTS-V wagon on display, although Acura did have their TSX Sportwagon there. From there, I went over to sit in the Focus ST and had a conversation with a couple that were checking out the car at the same time. At first, they had thought that I was a Ford salesperson based on the details that I was rattling off about the car, along with the Euro-only Focus RS. It wouldn’t be the only time that people thought that I was a salesperson based on info that I knew about the car. He was quite impressed with the Ricaro seats, but both kind of felt that it was a bit too small for them. They had a bit of an affinity with Volkswagen and Audi. The guy was looking at possibly getting a used Audi S4 or a BMW M3, but was siding towards the Audi for the quattro setup. Next, my friend and I went over to the Volkswagen display and I got to sit in the new Beetle. 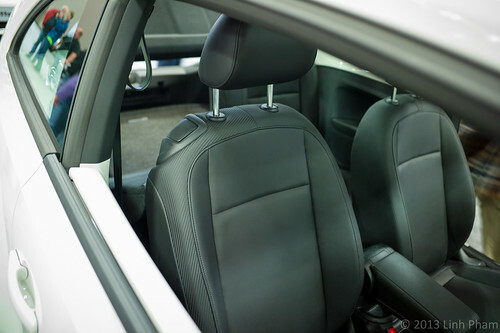 One relatively small thing that caught my eye and feel in love with was the carbon fiber-like weave and texture found on the sides of the seats. 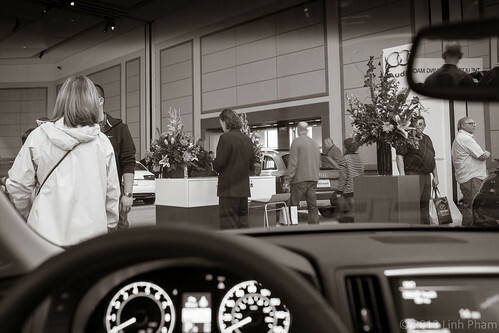 The Lincoln display was pretty dull, until I got to see the new MKZ. Moving on, I checked out the Mazda and Honda sections and sat in a Mazdaspeed 3, Accord Coupe, an MX-5 and a CR-Z. I have to say that the action of the shifter in the MX-5 probably had the best feel of all of the ones that I tried out at the show. The shifts were short, clean and had a nice mechanical feel about it. It was unfortunate that the CR-Z hybrid, which is available with a manual gearbox, had the meh-tastic CVT. After that, we went upstairs to check out the luxury brands (kind of funny that Cadillac, Lexus and Jaguar were not part of that group). When entering the large room where the rest of the luxury brands were located on the right-side, the very first brand on display was Audi. On display was one of each of the major models currently available for sale: a Q5 2.0T, an red S5 cabriolet, a red S4 (which one guy thought that the V6T badge on the side meant it had a twin-turbo setup), an A4, an A5 coupé, an A6, an allroad, a red TT, a Q7 and an Estoril Blue S7. Yeah, the R8 and the A3 were not represented. Unfortunately, the doors were locked on the S7 so any chances of getting an interior shot of the car was by sticking the camera into the open moonroof. While checking out the Audi spread, I ran into Scott Mitchell and had a nice chat. 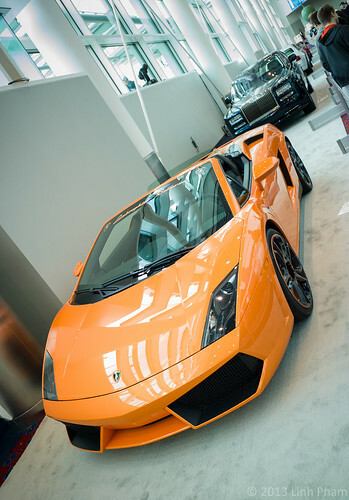 Although the auto show was in its second day to the public, this was his third day and would also be there on Sunday. After gawking at that Audi S7 a little bit more, I went over to the BMW display and sat in the 6 Series Gran Coupe (not enough headroom in the rear seat for me) and the X5. Interestingly and disappointingly, neither the X6 or the Z4 were on display. There were several people that were checking out the BMW M5 that thought it still had the V10. I bit my lip and moved on to the Mercedes-Benz display, which they had a nice matte gray SL AMG roadster cordoned off. Sticker price on that puppy was around $167,000. It’s nice, but would rather spend that money on an R8 coupé or Spyder any day. I tried out the SLK roadster on display, but it was pretty cramped for me. Between the door panel and the wide center console, there wasn’t enough girth for my legs and there might be some headroom problems if the top had been up. 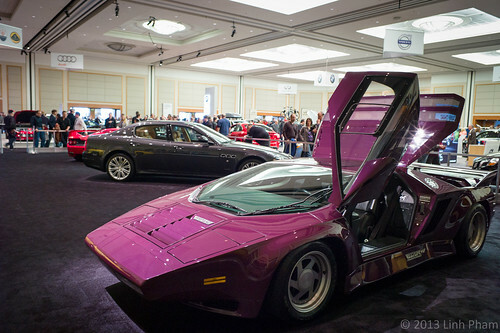 In the corner by Ron Tonkin’s Gran Turismo was a purple Vector W8 and a Ferrari F50 on display. The Vector is definitely something that you don’t see everyday, particularly one in purple. After browsing through Infiniti’s display and talking over a couple of movie ideas for the next PDX C&C movie day, my friend and I went on our ways and I went back to the Audi display (no surprise, yeah?) and spent a bit more time with some of the cars, including the Q5 2.0T and the S5 cabriolet. 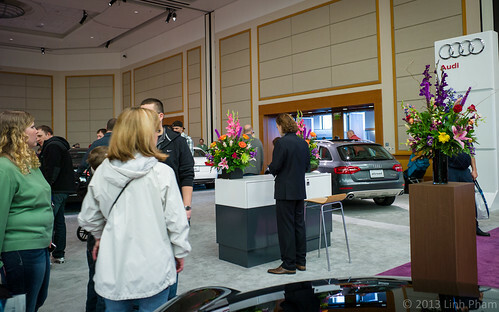 I then chatted with one of the sales guys from Audi Wilsonville and noticed that Scott was standing back at the little desk that was setup. 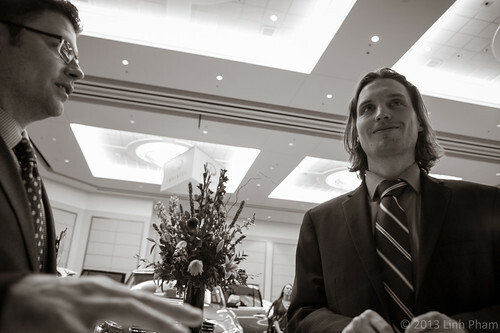 So after we finished chatting, I decided to sneak around and try to get some candid shots of Scott doing his thing. The first two shots below were taken from within the Infiniti G37 IPL convertible that was right behind Scott; with the first one from the driver’s seat and the other with the camera craned above the windshield. The other two were taken as I walked back around to chat with Scott again. By the way, I’m guessing it was the combination of using a relatively wide angle lens and the angle from which I had the camera that lead to the, er, well, interesting shot above. At that point, my knees and feet were screaming bloody murder and threatening to give out after standing or walking for about 5 hours (with only a short interlude while driving from PDX C&C and the auto show), I slowly made my way back downstairs and through the other parts of the show. There were two Bentleys and two Lamborghinis on display, along with a room filled with various stanced cars and other cars showing off aftermarket parts (some gaudy and some well done). 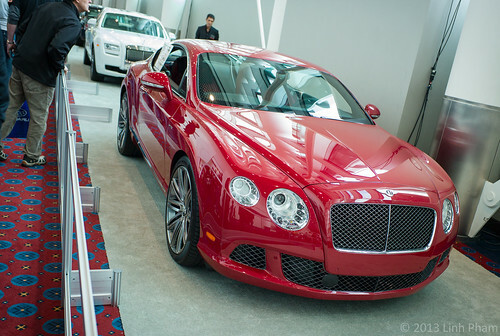 I finally bid adieu to the Portland Auto Show and made it back to my car just before my legs almost gave out. Will I come back next year? Most likely, though I will have to find a pair of shoes that are a bit better for standing and walking about for hours on end. For additional photos from the Portland Auto Show, please check out the “26 Jan 2013 Portland Auto Show” set on my personal Flickr photostream. Nice post Linh! 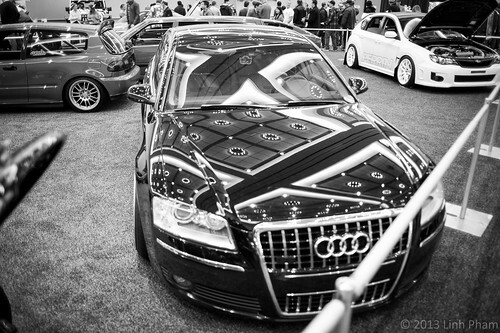 I hope to hit the auto show and see the S7. Thank you, Allen! The S7 in Estoril Blue is gorgeous.